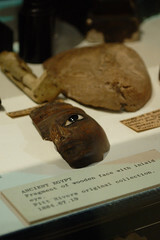 On November 10 the Egypt Exploration Society (of which J is a member) organised a guided tour round 3 Egyptian collections in Oxford. The first of these was the archives in the Griffith Institute (no photography permitted in this one) - they have a large collection of the notes, photographs, drawings etc of several important Egyptologists, including all of Howard Carter's documents. As this is not normally open to the public it was particularly exciting to be shown some of the collection. Two of the staff, Elizabeth Fleming and Catherine Warsi, gave us an hour's talk. First they gave an overview of some of the prominent Egyptologists associated with the Institute and then moved on to a biography of Howard Carter concentrating on his work in Egypt and the discovery of Tutankhamun's tomb in particular. They showed us several of the watercolours and line drawings he did in his initial jobs in Egypt (copying the Egyptian tomb & temple reliefs for publication), and the correspondence around the diplomatic incident that lead to him resigning his job with the Egyptian Antiquities Service (basically a bunch of French tourists refused to pay and the argument ended with the Egyptian guards and the French exchanging blows, Carter had the audacity to side with the guards because he believed they were in the right. The French concerned were highly enough connected to get their ambassador to make a fuss). The last third or so of the talk was devoted to the discovery and excavation of Tutankhamun's tomb for which he's most famous - we saw his diary entry for the day concerned, which is the only entry in the book that's not neatly written on the lines, instead it's scribbled practically sideways. 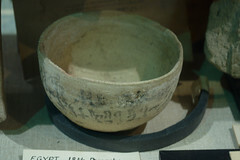 We also saw one of the "object cards" for an item in the tomb (the throne (linked photo is of a replica)). These were the 1920s equivalent of a database - each object was numbered, and had several cards (a little smaller than A5, of the sort that fit in a card file) which gave basic description, more detailed description, photos (with annotations and without), drawings of particular areas, measurements, composition etc etc. Basically every fact that they could determine as they took it out of the tomb. 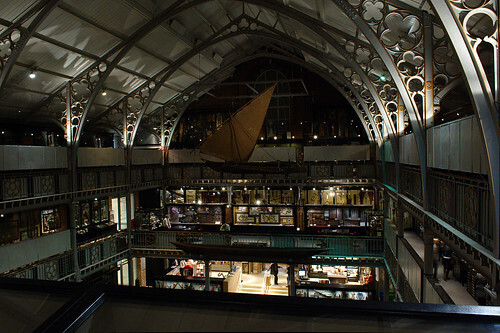 The next visit was to the Pitt Rivers Museum - this is an anthropological museum and instead of being organised by place or people it's organised by type. It also has an incredible number of objects on display. So you have these fantastic cases that have things like "every flute in our collection", or "all the model boats", and there's always something to see that you hadn't noticed before. Our tour here was guided by Alice Stevenson, one of the curators. She first gave us a 15 minute talk in a lecture theatre, this covered an overview of the museum's origins and collections. Pitt Rivers was a Victorian general, who started off collecting rifles of various different types so that he could compare them and possibly extrapolate better ways of making a rifle. But he got obsessed with making collections of all sorts of different objects, and trying to organise them in a sequence from "primitive" to "advanced" - a typically Victorian attitude to comparisons between civilisations and cultures (obviously British was his definition of "advanced"...). The museum has moved on from that philosophy, but still organises their cases by type because it provides you with a different perspective than the typical organisation. She then took us round the museum to show us a handful of key Egyptian objects in their collection before setting us free to explore. The key items she pointed out were a fragment of a beautifully carved wooden face dating from the New Kingdom, a Middle Kingdom funerary model boat, pottery bowl inscribed on the outside in hieratic and their mummy & coffin set (from the 24th Dynasty). 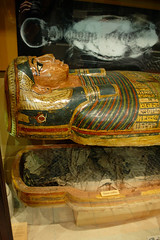 I was particularly amused by the story associated with the latter - when the then Prince of Wales & his wife went out to Egypt for their wedding anniversary in 1869 they visited an excavation site where, gosh!, they just happened to unearth some coffins with mummies in that very day. They were given to the Prince, who brought them back to Britain & donated them to museums. It's unlikely they were actually excavated for real right there & then, but some of them did probably come from the same tomb originally. 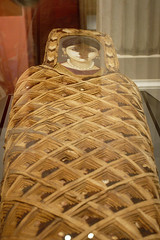 Egyptian coffins generally have names and genealogies on them, this one (for a woman called Irtaru) is listed as the mother of the one in Manchester and her husband is the one that is now in Edinburgh. And finally, after a break for lunch, we visited the Ashmolean Museum guided by Liam McNamara, the Assistant Keeper for the Egypt & Sudan department (which means he's the man in charge - the Keeper (now known as the Director) is the person in charge of the whole museum, department heads are Assistant Keepers). This tour was partly about the objects we looked at, and partly about the refurbishment of the museum and the philosophy and ideas behind how the objects are currently being presented. The whole museum has been redeveloped and modernised over the last few years, which has been a great success (particularly in terms of increasing visitor numbers). The Egyptian galleries were some of the more recently re-opened areas and have been extensively modernised - in particular the rooms were previously fairly poorly lit, and some key items were tucked away in corners where you could easily miss them. 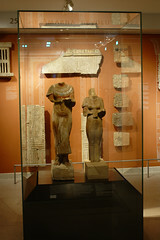 The new Egyptian galleries are organised chronologically, starting with a large room of pre-dynastic Egyptian material. 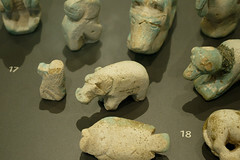 The Ashmolean has one of the largest collections of pre-dynastic Egyptian objects outside of Cairo. 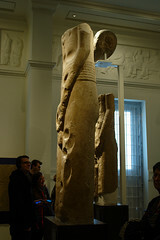 This is due in large part to the poor judgement of a curator at the British Museum - Petrie excavated two colossal pre-dynastic statues of the god Min and felt that they were significantly important pieces. When he offered them to the BM the then curator, Budge, refused them on the grounds that he thought they were "unhistorical" and not important at all. Petrie took offence, and offered them and all his subsequent finds to the Ashmolean. 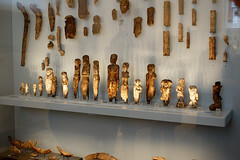 He went on to excavate a large amount of pre-dynastic material, the bulk of which is at the Ashmolean. They also have some important items from later in Egyptian history - including the Shrine of Taharqa, which is a shrine built for a Nubian Pharoah of Egypt, and a part of a wall painting from Akhetaten (Amarna). Both of which were previously on display, but not well lit. 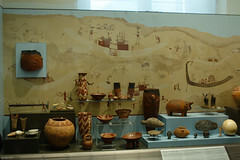 In all the rooms they've tried to lay out the cases so that objects are in context - so the pots in the pre-dynastic display are in front of a copy of a cave painting from the right era. The bits of an Amarna doorway are laid out on the wall in the positions they would've been in with statues of Akhenaten and Nefertiti positioned as if they were walking out of the door. A big change from the previous cases of things like "all our amulets" (which I quite liked as well, but the new ones are more modern and probably appeal more to visitors who don't already know a fair bit about Egypt). All in all a very good trip. 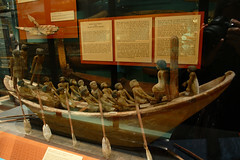 Particularly nice to see the stuff in the Griffith Institute as it's not possible to just visit there, but the Pitt Rivers & Ashmolean tours were also interesting (and provided a lot of context for understanding why the exhibits in the two museums are laid out the way they are). As well as the photos in this post, I've got a few more on flickr.